Dramatically increases Horsepower and Torque of engine. Accelerating using 1st gear from a stationary position, you can feel the “Ferrari” horsepower effect. With our NEW IMPROVED FORMULA, in terms of power, you will feel like your engine is running on Gasoline/Petrol RON 99, when in fact it is running on RON 95. It will stick to the surface of the engine parts to provide extra protection and performance. Prevents formation of gum and sludge inside the engine, as it contains cleansing properties. To prove this point, users can simply observe the cleanliness of the dip stick before and after RTR Engine Treatment Booster Oil is added to the engine. The dip stick is very much cleaner when RTR Engine Treatment Booster Oil is added to the engine. After surpassing the recommended lifespan mileage of common mineral based engine oil, which is 5000 kilometers, the mixture of RTR OIL and mineral based engine oil still does not have the burnt smell like common mineral based oil, it smells just like any common Fully Synthetic Engine Oil. The beauty is the mixture does not have burnt smell after the 10000th kilometer. Reduces Friction inside the engine, thus the engine will run SMOOTHER and QUIETER. Reduces Carbon Emission, as drivers only need to press on the accelerator lightly. Smaller combustion is already enough to get the engine going, because RTR Engine Treatment Booster Oil has already effectively reduces friction between the moving parts. Reduces gaseous contaminant that flows in the engine especially via the PCV (Positive Combustion Ventilator). This gaseous contaminant will cause less effective combustion that causes engine unresponsiveness and increases engine oil acidity that reduces the engine longevity. Reduces Engine Operating Temperature and Engine Stress. Extends Engine Oil lifespan, therefore less frequent engine oil change is needed. After mixing with Mineral Based Engine Oil, the lifespan of the engine oil will be extended from 5000km to 10,000km. As for Semi Synthetic Engine Oil mixture, its lifespan will be extended from 7000km to 10,000km. The performance of the mixture WILL NOT DETERIORATE even after 10,000km, therefore the engine performance and horsepower WILL NOT DETERIORATE after the 10,000th km as well. Dramatically reduces Engine Knocking (Provided The Engine is Properly Tuned). Provides optimal protection against Engine Wear. Therefore prolongs engine lifespan. Effectively reduces engine noise produced by tappets and hydraulic lifters. Basically you do not need to purchase tappet noise stopper, hydraulic lifters additive and engine treatment oil separately. 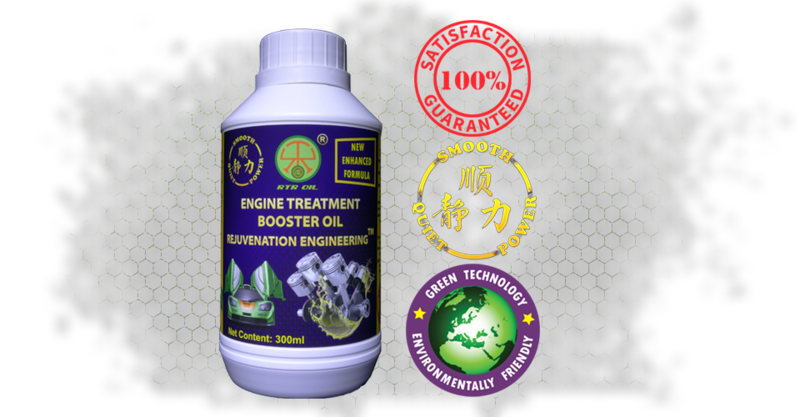 RTR Engine Treatment Booster Oil is the treatment oil that solves what the formerly mentioned type of products could, and helps you to save costs. Use mineral based oil. WHY?? Here is why…. Another important feature to note about RTR Engine Treatment Booster Oil. It is a fact that loss of engine lubricant oil occurs when a car is travelling at high speed. But engine oil consumption is much lesser if user used RTR Engine Treatment Booster Oil mixed with mineral based oil as compared to using only pure fully synthetic oil, it is because mineral based lubricant oil has higher viscosity than Fully Synthetic ones. If engine oil loss occurred in the former, you only need to add in mineral based engine oil. Remember, no further addition of RTR Engine Treatment Booster Oil is required because one bottle is enough to last more than 10, 000km. If there be any engine oil loss at intervals, our research team found that up to 2 liters of mineral based engine oil can still be added WITHOUT AFFECTING THE ENGINE PERFORMANCE AND POWER. Basically RTR Engine Treatment Booster Oil is equipped with REJUVENATION ENGINEERING™ Technology. Moreover, it can also cure most of the cars and vehicles engine “sickness”.